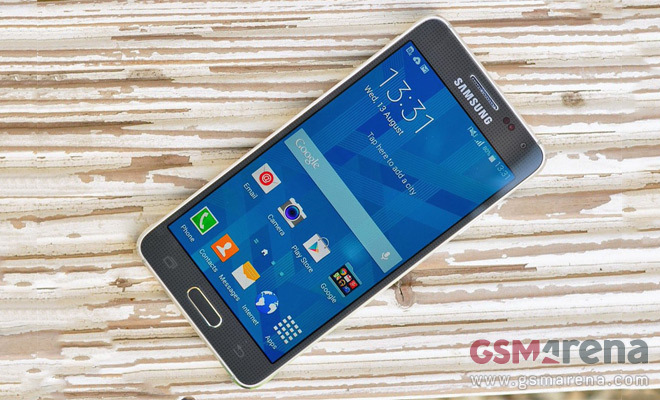 The Samsung Galaxy Alpha uses a 4.7″ Super AMOLED display with 720p resolution and 312ppi pixel density. That’s a first for a Samsung phone – the Galaxy S III was a 4.8″ 720p screen while the Galaxy S5 mini has a 4.5″ 720p screen, both close but not the same. A rumored Galaxy S5 Neo is expected to use Alpha’s screen. Anyway, the latest generation of Super AMOLED boasts improved sunlight legibility and color accuracy along with reduced power usage. As usual viewing angles are stunning. The 300ppi may not be cutting edge these days, but it’s enough by our books. It’s really hard to actually see any imperfections though if you look close enough you can spot the telltale signs of the PenTile matrix. It’s the diamond pattern arrangement that Samsung has been using for a couple of generations of Super AMOLED, which does look better than the regular PenTile arrangement. 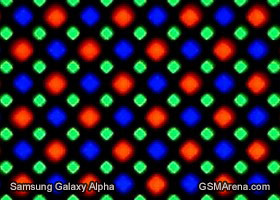 The Galaxy Alpha screen proved slightly brighter than the Galaxy S5 mini screen though not quite as bright as the big Galaxy S5. Outdoors in the summer sun, the brightness comes a bit short. Black levels are perfect though resulting in an impressive contrast ratio. The Sony Xperia Z1 Compact has amazing contrast too and it’s a potential competitor to the Alpha (though the upcoming Z3 Compact is where the real battle will be). Super AMOLEDs rely on their low reflectivity for good sunlight legibility so even with an average brightness (compared to LCDs) the Galaxy Alpha screen is among the best we’ve tested in our Sunlight legibility test. It’s practically as good as the Galaxy S5 screen or the Apple iPhone 5s screen. Aside from Android minis, the Alpha will also fight it out with the new iPhone, so this is an important comparison. Of course the iPhone 6 is the real target and we have no measurements of that but if the iPhone 5s is of any indication, it should offer great sunlight legibility as well. Colors are beautifully rendered on the Samsung Galaxy Alpha’s screen but everybody have their own preferences when it comes to color saturation. The Screen mode option lets you pick between more saturated or more accurate options for the saturation. There’s a slider in the notification area to adjust the screen brightness. If you enable auto brightness that slider biases the automatic setting towards brighter or darker. You can enable an automatic screen tone adjustment, which promises to improve battery life by adjusting screen settings to the image it’s displaying. Another option is Smart stay, which prevents the display from locking while you’re looking at it. This way you can keep the screen timeout at a short setting (say, 30 seconds) without the annoyance of having to manually keep the screen on while reading a longer article. If you’re wondering what’s with all the battery saving tips, it’s because the battery capacity of the Galaxy Alpha is lower than we’re used to on a 4.5+ inch phone. The battery tests will reveal if those tips were necessary or not.